President Trump broke his silence on the IG Report with a vengeance Friday. Trump tweeted that the “IG Report is a total disaster for Comey, his minions and sadly, the FBI. Comey will now officially go down as the worst leader, by far, in the history of the FBI. I did a great service to the people in firing him. Good Instincts. Christopher Wray will bring it proudly back!”. Trump then had an impromptu interview with “Fox & Friends” where he continued to blister the “scum on top” of the Obama-era bureau. Trump’s a known fan and regular viewer of the morning Fox show. Fox News announced Trump would appear on the show in a press release at 8:19 a.m.
Reporters crowded Trump as he left the White House to cross the lawn. The president’s comments came a day after the release of the report. A report which was the result of an 18-month-long investigation by DOJ Inspector General Michael Horowitz. Trump said the report, which found ex-FBI Director James Comey was insubordinate, showed Trump was justified in firing him. “I think Comey was the ringleader of this whole den of thieves,” Trump said. Liberals suggest that Trump’s firing of Comey amounted to obstruction of justice, however; Deputy Attorney General wrote a recommendation that Comey be fired. The IG report also focused on political bias within the bureau, specifically referring to FBI officials Peter Strzok and Lisa Page over an exchange of a series of politically-charged, anti-Trump text messages. The inspector general released new text messages between the two that suggested that they would “stop” Trump from becoming president. “Trump’s not ever going to become president, right? Right! ?” Page texted Strzok in August 2016. Trump blasted Strzok early Friday on a separate tweet. Strzok and Page, who were romantically involved, both served on Special Counsel Robert Mueller’s Russia investigation team. It doesn’t get more biased than this. How can Anything that comes out of the Mueller Investigation not be tainted with liberal biases? Strzok was reassigned following the revelations of his anti-Trump texts. Page resigned from the bureau last month. Too little too late. Their biases and many others are embedded in the investigation. There is no way to conduct a bipartisan investigation that includes an entire team of liberal FBI members. 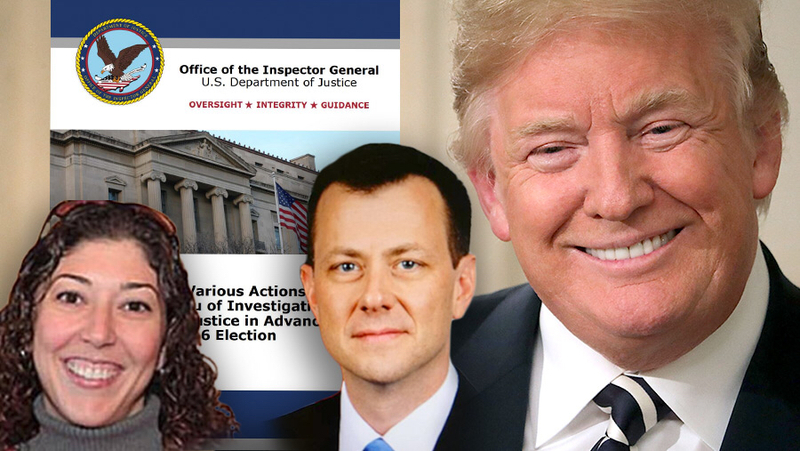 Many of those texts were made public in late 2017, however; the IG report revealed a new one in which Strzok vowed to “stop” Trump from becoming president, and made clear that as many as five total FBI employees exchanged politically charged messages. “The text messages and instant messages sent by these employees included statements of hostility toward then-candidate Trump and statements of support for candidate Clinton,” the report said. “I don’t know how Peter Strzok is working there anymore,” Trump told Doocy. We as Americans demand to know who those Agents are. This is criminal activity and we have the right to know. Release the full report. “I find anyone who enjoys [this job] an absolute f—ing idiot. If you don’t think so, ask them one more question. Who are you voting for? I guarantee you it will be Donald Drumpf,” Agent 1 sent. This is criminal. The entire report proves bias. President Trump, On Thursday, called the underlying allegations, regarding Russian interference, a “pile of garbage,” and blasting Special Counsel Robert Mueller and Democrats for pushing the “phony crime” of collusion. The liberal biased News Pundits are trying to saturate the news with a lie in hopes it will go away quickly. We need to keep the truth in the light!